Clear and maintain rights of way. Thin the understory to prevent wildfire and improve forest health. Remove invasive and unwanted vegetation. Perform other small land-clearing jobs. The uses don’t stop at small shrubs, however. These attachments can also remove up to 8-inch diameter trees and 12-inch stumps that need to be eliminated from the ground’s surface. The severe-duty design utilizes oversized 2 1/2 inch roller bearings and double carbide teeth for improved durability. The two-speed hydraulic system ensures the machine’s horsepower is utilized efficiently. The attachment’s body shape is designed to produce greater strength and a longer equipment life. A staggered tool pattern is included, which reduces power draw while enabling faster cutting and increased overall production. A hydraulic oil cooler kit is available for those that work in high-temperature conditions. The attachment’s heavy-duty push bar is a great feature for toppling trees or brush and helps to protect the carrier. 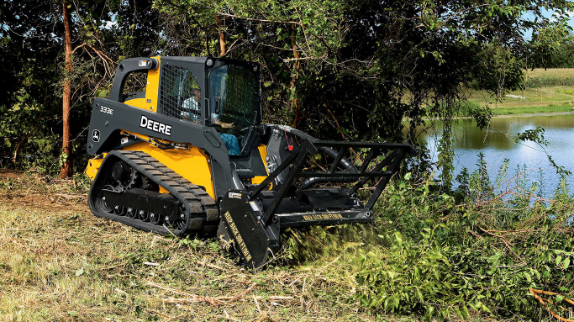 The compact equipment that’s being used to operate the mulching head should always be outfitted with a forestry protection package which includes a severe-duty front door, light guards, hose guards, side window shields, falling object protection structure, rear window screens, a rear bumper, and rubber debris seals. We hope this post provided you with the information needed to make an educated purchasing decision. However, if you have any additional questions about John Deere mulching heads or other Worksite Pro attachments, contact your local John Deere dealer.